Scrooge is really, really not in the mood for a visit from Santa this year. io9 has a teensy snippet from tomorrow’s very special episode of the DuckTales reboot, “Last Christmas!”—part of Disney and ABC’s “25 Days of Christmas” programming lineup, featuring festive content across Disney, Disney Junior, ABC, and Freeform throughout December. The special sees the gang sent on a time-traveling adventure (funny that, considering Doctor Who’s David Tennant voices Scrooge) to Christmas parties of the past...thanks to Scrooge wanting to avoid anything Christmas related, in his humbug mood. It’s all very A Christmas Carol, obviously. Or I guess in this Disney-specific regard, a bit “Mickey’s Christmas Carol,” right? Scrooge might be a lost cause, but if that doesn’t give you a modicum of festive cheer, then I don’t know what will. 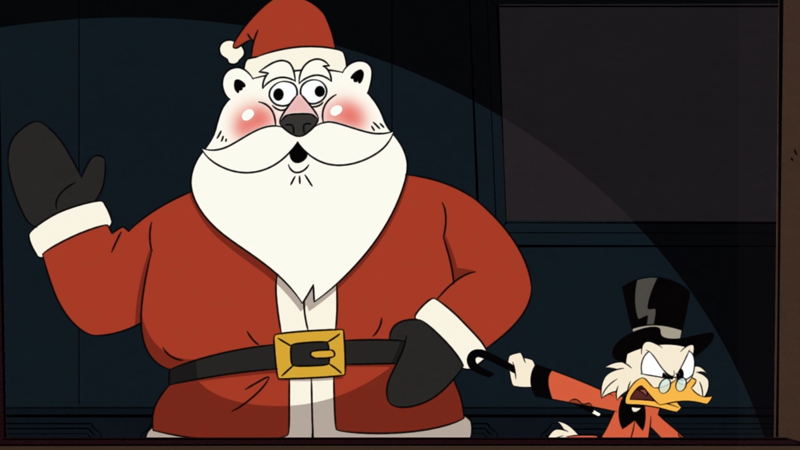 DuckTales’ “Last Christmas!” will air on the Disney Channel tomorrow, December 1, at 7:30 a.m. EST.